I haven’t gone running since I stepped on a dead mouse 2 weeks ago. I haven’t folded the laundry from last week. I just keep moving the pile around. I haven’t returned the library book I checked out months ago. But mostly, I haven’t used this little heart waffle maker since a Belgian waffle maker came into my heart, life, and kitchen. I’m a fool! I love all waffles. You see, I’m an equal opportunity waffle eater. And I like these waffles specifically based on their crunchy edges! It’s truly lovely! And when you reheat them in the oven (which I totally recommend) they get super crunchy all over again! Makes me want to turn the leftovers into waffle nachos or something. I wouldn’t put it past me. Make brown butter by melting 3/4 cup butter in a medium saucepan over medium heat. Cook, stirring often, until butter foams, then browns, but doesn’t burn, about 5-8 minutes. Pour into a small bowl to cool slightly. Whisk milk, buttermilk, sugar, yeast, and salt in a large bowl. Whisk in flour and brown butter; cover with plastic wrap and let batter sit at room temperature for 8-12 hours. If it will be longer, pop it in the fridge until time to waffle. Cook until waffles are golden brown. Serve immediately with butter, syrup, powdered sugar and berries. Enjoy! *Mine takes bout 1/2 cup per waffle, but I totally overflowed it for the first couple to get that knowledge down. I saw this recipe in Bon Appetit and put it in my yes, I need to make that, pile. Well, yours are prettier than theirs and now I really need to make them! Pinned! !!!! YES! I also saw them in there and post-ited them and now I have to make them pronto. They are SO good. I made the whole recipe for just me! Oh my lord. This is why everyone needs a waffle maker. Hell Yeah!!! 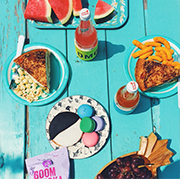 I need to get down with these.. you also now have me thinking about waffle nachos..
Yeah girl, chicken and waffle nachos! Hoy heck, yes!! I need these and a heart shaped waffles maker! You totally do! I love love AND waffles. These are the cutest waffles ever! All food should be heart shaped! Thanks, Maggie! And I agree heart-shaped errything! 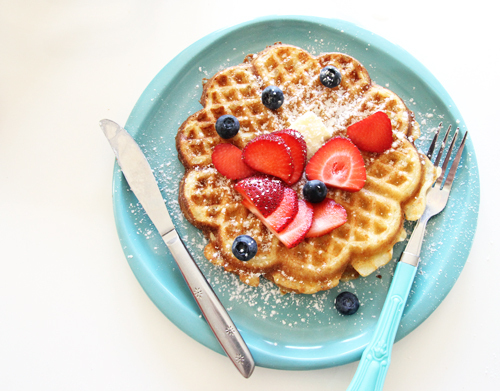 we only ever had heart shaped waffles growing up…my mom only had that kinda waffle maker. and I know I’d love these too, I’m all about browned buttah and crispy edges! Fun! I love yeast waffles, but haven’t made them myself. These look great! Waffles are just the best, aren’t they? Btw, your jogging incident is literally my worst fear. Oh god. Grossest, right?! I hope it never happens to you! 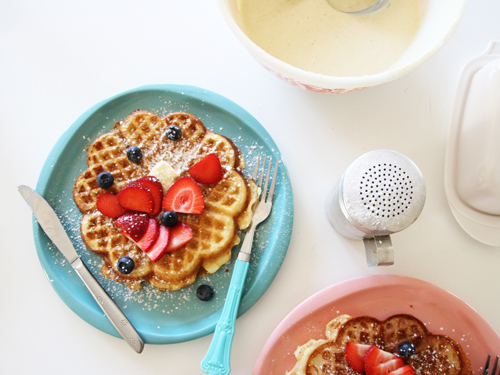 These waffles are the prettiest! 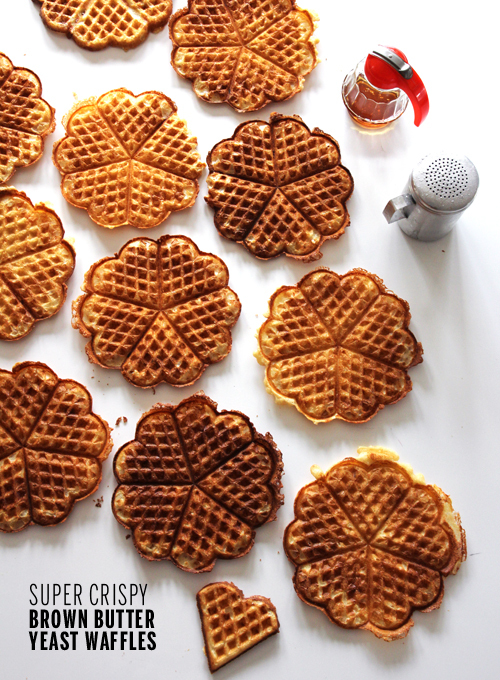 I love the sound of the crispy edges and heart-shaped waffles just make them that much better. Love your estate sale treasures, too! OMG this waffle maker makes the cutest waffles! They look like they have the most perfect crunch so they don’t get too soggy from all the syrup I plan to pour over them. Thanks, girl! And yeah man! They’re too crispy to be soggy, for reals! Thanks, Sophie! I hope your week gets waffle-fied! Oh no, Izy! You need a waffle iron for real! 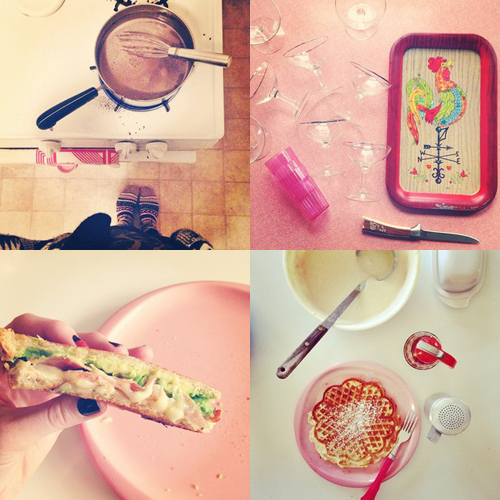 I can only imagine the dreamy waffles the world would have if you were making them. Is it possible that the heart shapes make them MORE delicious?! i wouldn’t put it past them. 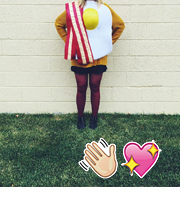 And now I totally want a waffle sandwich. You’re speaking my language, Joanne! Waffle sandwiches for the win! You had me at super crispy. Also, folding laundry is overrated. Previous post: I went to San Francisco!